Fritz Henderson: Bankruptcy becoming more probable. 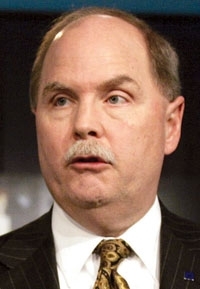 DETROIT -- General Motors CEO Fritz Henderson said the automaker will start notifying its dealers a bit later this week on its plan to eliminate about 2,700 dealerships by 2010. That specific plan is being finalized here early this week, and well began notifying dealers later this week, Henderson told reporters during a weekly conference call this morning. GM, staying afloat on $15.4 billion in U.S. loans so far, is grappling with a government-imposed June 1 deadline to reach agreements to restructure operations and cut more than $40 billion in total debt. Over the last several days, GM executives increasingly have signaled the possibility of a bankruptcy filing as the automaker has made little progress in negotiating with its bondholders. GM wants bondholders to take 10 percent of stock in the reorganized company in exchange for about $27 billion in their debt. Representatives of GM bondholders have said they are being offered an unfairly low payout. They have asked instead for a majority stake in the restructured company. The government didnt support us going above 10 percent, so we went to the maximum that they would allow us, Henderson said of the debt exchange offer. Henderson said GM was still working on a time frame for how soon a dealership would have to close if it was selected to shutter. We would try to work with our dealers for an orderly wind down, he said. That wind down would include GM buying back dealership signage, special tools and dealers unused inventory. GM also would honor all warranties and work with dealers to make sure customers know they will continue to be serviced by other GM stores. The National Automobile Dealers Association has taken a strong stance against GMs move to slash dealerships, arguing it would hurt GMs market share and destroy millions of jobs.  GM will make more salaried job cuts. Henderson will have the plan for those cuts and announce how many jobs will be cut it by the end of May.  There are a number of parties interested in buying Saab, Henderson says. Saabs reorganization and sale is being in Sweden. A resolution on Saab will happen during the next month or two.  GM is speaking with multiple bidders regarding a partnership with Opel and its target is to have an agreement before the end of this month.